The Tamron SP 90mm f/2.8 Di 1:1 Macro lens offers a life like 1:1 magnification ratio. For a true discerning macro photographer this is a great lens not only because of the magnification but also for its build quality and fast f/2.8 aperture. Sadly, it doesn’t have Vibration Control (VC) like newer version Tamron SP 90mm F/2.8 Di MACRO VC. The lens quality is good and commensurate to the quality of Tamron’s SP lens line. 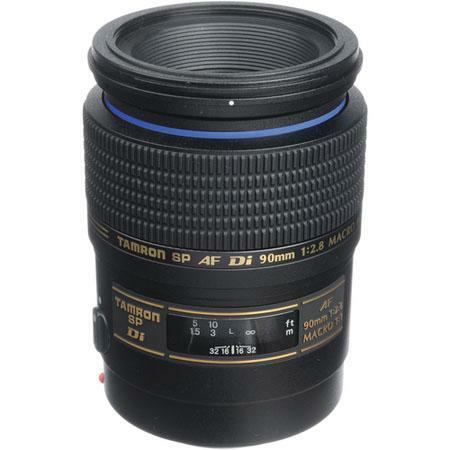 It enjoys many of the great features of Tamron’s high quality lenses. While focusing care should be taken that you don’t bump the front elements of the lens on to the subject as the lens extends manifolds even for a short focusing range. The Tamron SP 90mm f/2.8 Di Macro does have a decent auto-focusing feature. However what it lacks in focusing speed and build quality (as some of the Sigma and Canon macro lenses in the same category do score over the Tamron) it overcomes in sharpness. A lens with such close focusing distance (11.4”) it is obviously a problem if the aperture is stopped down all the way. So ideally a wider aperture is suitable for the purpose of capturing small subjects with the background completely blurred out. Diameter x Length ø2.8 x 3.8in.